Mumbai: In 2005, Mahishasura, a painting by modern artist Tyeb Mehta, became the first Indian artwork to breach the $1 million barrier at a Christie’s auction in New York. The mythological buffalo-demon is now set for a payback as another artwork by Mehta, this time depicting the goddess Durga slaying Mahishasura, is poised to set a new record. International auction house Sotheby’s, which opened a Mumbai office in 2016, announced plans on Tuesday to start auctions in India—their inaugural show, Boundless: Mumbai, is scheduled for December 2018 in Mumbai, adding to their calendar of annual sales in New York and London. The Tyeb Mehta work that will lead the Sotheby’s India auction, Durga Mahisasura Mardini, was painted in 1993, four years before Mahishasura. Appearing on the market for the first time, it is a never-seen-before private commission, “among the most valuable works of modern South Asian art ever to be offered at auction", said Gaurav Bhatia, managing director of Sotheby’s India. In May 2017, a new world record was established for Mehta when his Woman On Rickshaw was sold for Rs22.9 crore by Christie’s in London—also becoming the most expensive work of South Asian art sold globally last year. Mehta has traditionally been dependable at auctions. 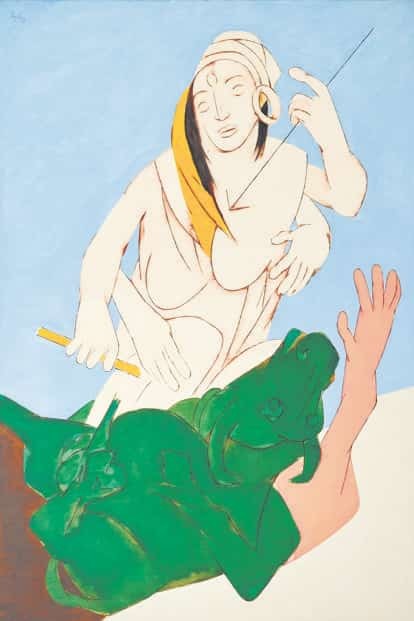 While Christie’s and Saffronart have both had record-breaking sales with Tyeb Mehta works, this is Sotheby’s “Mahishasura moment", according to Bhatia. Artistic depictions of good over evil have resonances that go as far back as Raphael’s St. Michael Vanquishing Satan or Guillaume Courtois’s David and Goliath. “Here, Tyeb’s reconfigures this theme as an allegory for the 20th century, with disharmony threatening to rip apart the social fabric of India… In the avenging figure of Durga, Tyeb alludes to a sense of prevailing calmness and victory," said Bhatia, also calling out the colour scheme of the painting, which references the Indian national flag. 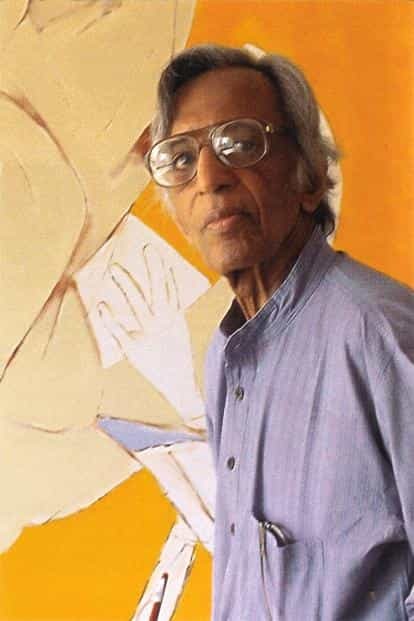 Mehta, who died in 2009, belonged to the first generation of post-colonial artists along with S.H. Raza and M.F Husain. As a Muslim artist who stayed back in India during the Partition, the street violence of 1947 fundamentally changed his outlook. What makes Durga Mahisasura Mardini a seminal work is that it was painted a year after the Mumbai riots of 1992, at a time when the artist was recuperating in Shantiniketan in West Bengal where “he could feel Durga everywhere". It is the work that flagged off the iconic Mahishasura series. 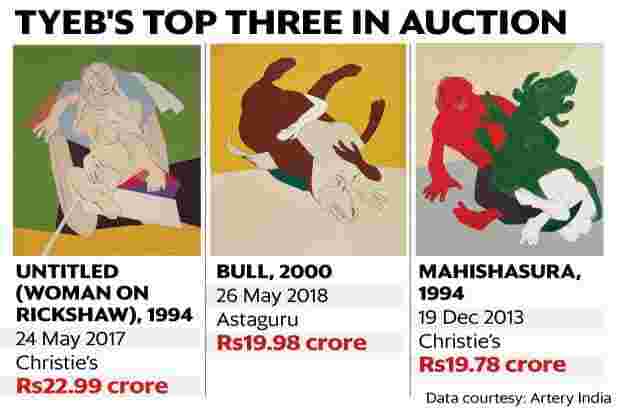 According to Artery India, a Delhi-based database of Indian art, only 113 canvases by Tyeb have been sold in auctions over the past 30 years. Of these, a mere five have been from the Mahishasura series (one work has sold thrice). “There are less than a dozen significant canvases from this series, clearly marking this as being a valuable and rare prize," said Arvind Vijaymohan, chief executive of Artery India. “The artist, like most of his leading Modernist peers, has recorded strong growth in valuation over the past 18 months... The performance of this asset will depend on a number of factors. One being the reserve price set for it. The second is the selection of other works by this artist that are made available via other auction houses or in the private market, in the months leading up to this sale," added Vijaymohan. In their 19 March auction of Modern and Contemporary South Asian Art in New York, Sotheby’s failed to sell Raza’s Ville Provencale, branded as “one of the most monumental and significant paintings by Raza to appear on the market". The variables in the art market are difficult to predict; some demons remain impossible to slay.